IntelliStage, the industry leader in portable, modular staging, announces it’s latest line in it’s family of staging solutions, Staging 101. 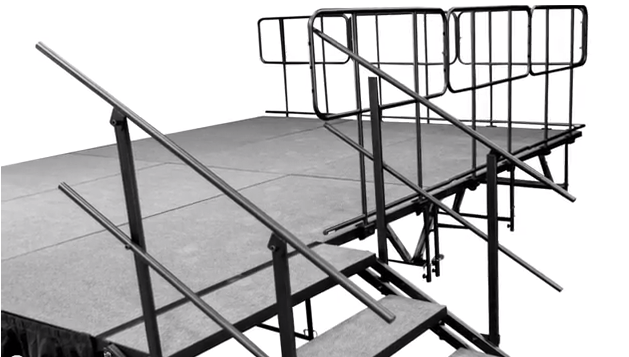 The Staging 101 system is comprised of 4’x8′ platforms with folding legs and a telescopic base allowing adjustments of +/- 8 inches. Everything in this system is completely modular, in keeping with the strategy behind all of their staging systems. The stages can easily be set up by two or more people. When not in use, they store compact in one of IntelliStage’s transportation trolleys. This system is perfect for schools, houses of worship, hotels, DJs, event organizers, and much, much more. See for yourself how simple, secure, and well thought out this portable staging system is. Watch this video to learn all about it! What sets Staging 101 apart from their competitors? Attention to detail for safety, durability, and appearance is a top priority for every modular stage system IntelliStage creates. Staging 101 is no different. Click here for some in depth detail of the differences between Staging 101 and their competitors. We know you’ll be impressed. To learn more about Staging 101 and IntelliStage- call us at 800.727.9281. We’ll set up an appointment with you at your convenience. Or, if you already know what stage system you want, let us know, and we’ll check it over and get you a quote ASAP. It’s that simple!